"Scientific Researches! New Discoveries in Pneumaticks! 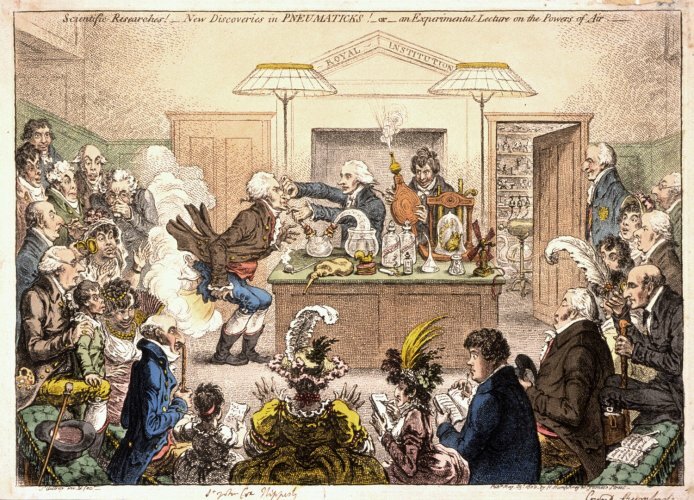 or an Experimental Lecture on the Powers of Air" by James Gillray, 1802.
believed to be Thomas Young. Humphrey Davy is depicted standing next to Young operating the bellows. Courtesy of Chemical Heritage Foundation. Gift of Fisher Scientific International. Photograph by Gregory Tobias. This image may not be reproduced elsewhere.